Along the Great Lakes, America’s inland seas, lighthouses played a vital role in the growth of our nation. They shepherded settlers traveling by water to places that had no roads. These beacons of light required constant tending even in remote and often dangerous places. Brave men and women battled the elements and loneliness to keep the lights shining. Their sacrifice kept goods and immigrants moving. Seven romances set between 1883 and 1911 bring hope to these lonely keepers and love to weary hearts. The Great Lakes Lighthouse Brides Collection is available at Amazon, Barnes & Noble, Christian Book Distributors, Target, Walmart, and other online retailers. Two love stories. One historic treasure. An adventure to preserve them all. Congress, caring for America’s oldest documents. So when she intercepts an inside threat by a radical group planning to steal part of Thomas Jefferson’s original collection, she takes it to the highest authority–her father, the president. When he fails to take the threat seriously, she steals the books to keep them safe. Undercover FBI agent Cole Harding is close to disbanding the group responsible for killing his father. Believing documents once owned by Thomas Jefferson hold clues to answering a two hundred year old question, the group’s next target is the Library of Congress. However, he wasn’t expecting the First Daughter to get caught in the middle. Will Cole convince the president to trust his abilities? Can he keep Liberty safe without blowing his cover? Can either protect their hearts? Preserving Liberty is available for purchase at Amazon and Pelican Book Group. Weddings are the last thing beekeeper Huck Anderson wants to be associated with, considering his past. So when he inherits a building occupied by a bridal boutique, he aims to evict the failing business and open a sporting goods store. That is until his tenant ends up being Arianne Winters, a woman he’s indebted to from a mistake made years ago. When a life-threatening injury derails Huck entirely, Arianne offers a compromise to keep her boutique and her life out of bankruptcy—she’ll aid in his lengthy recovery if he’ll allow her to remain in his building. But nursing her adversary proves challenging when her adolescent crush resurfaces. How to Charm a Beekeeper’s Heart is available for purchase at Amazon, Barnes & Noble, iBooks, IPG, Pelican Book Group, Books-A-Million, Walmart, and Target. She thought she had it all. Until she discovered the treasures in the snow. latest gossip magazines, that is. Her last number-one hit was six years ago, and her songwriting ability has vanished. Her foundering career is all she has left, and she’s determined to once again hold the title of “Country Music Queen.” But Raelynn’s dreams are derailed when a coal mine collapses in her home town of Eve Hollow, West Virginia, trapping her daddy and brother inside. The man in charge of the mine rescue is Lane Ryan, her childhood best friend and the former fiancé she abandoned twelve years ago for her career. In the snow-covered mountains of Appalachia, Raelynn reconnects with family and rediscovers her musical abilities—and her faith. And no one inspires her more than Lane. She’s finally ready for a relationship, but the secret Lane carries around is as big as Coal Mountain. Will Raelynn sacrifice her title, or say goodbye to Lane forever? Silver White Winters is available at Amazon, Barnes & Noble, Christianbook.com, and Pelican Book Group. To Darcy Carr the holiday is depressing enough without reliving it every day. Her thriving wreath business and faithful cat are no longer enough to distract her from the pain of her past memories or her current loneliness. Is her frosty neighbor, the only man in town with no Christmas decorations, just another Scrooge, or could he be the one she’s been looking for? Coppersmith Dean Whitfield hasn’t celebrated Christmas—or anything else—since the death of his wife and unborn child. And he certainly has no desire to carry on the family tradition of crafting a star for the town’s Christmas tree, even if it will benefit a charity. Can Darcy and the joy of the season thaw his frozen heart and help him love again? 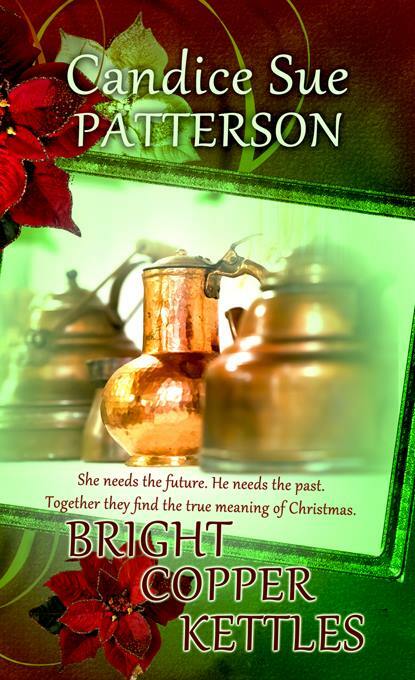 Bright Copper Kettles is available at Amazon, Barnes & Noble, Christianbook.com, and Pelican Book Group.